What are allergies and how do they affect cats? 1. The most common manifestation is itching of the skin, either localized in one area or a generalized reaction all over the cat's body. 2. Another manifestation involves the respiratory system and may result in coughing, sneezing, and wheezing. Sometimes, there may be an associated nasal or ocular (eye) discharge. 3. The third manifestation involves the digestive system, resulting in vomiting, flatulence or diarrhea. Does that mean that there are several types of allergies? There are four common types of allergies in the cat: contact, flea, food, and inhalant. Each of these has some common expressions in cats, and each has some unique features. What is meant by the term "flea allergy"? "In an allergic cat, just one bite can result in intense itching that can last for days." In spite of common belief, a normal cat experiences only minor skin irritation in response to flea bites. Even in the presence of dozens of fleas, there will be very little itching. On the other hand, the cat with flea allergies has a severe reaction to flea bites. This occurs because the cat develops an allergic response to proteins or antigens that are present in the flea's saliva. When a flea bites a cat, some of its saliva is injected into the skin. In an allergic cat, just one bite can result in intense itching that can last for days. Cats with flea allergy dermatitis (FAD) do not have to be infested with fleas; a single flea is enough to cause a problem! What does this reaction do to the cat? The cat's response to the intense itching is to chew, lick, or scratch the affected site or sites. This causes hair loss and can lead to open sores or scabs on the skin, allowing a secondary bacterial infection to develop. The area most commonly involved is over the rump, just in front of the tail. Many flea-allergic cats chew or lick the hair off their legs. Itching and hair loss around the tail base, neck and head should be considered suspicious for flea allergy dermatitis. In addition, the cat may have numerous, small scabs around the head and neck. These scabs are often referred to as miliary lesions, a term that was coined because the scabs look like millet seeds. How is flea allergy dermatitis diagnosed? Clinical signs often give the first indication that your cat may suffer from FAD. Cats are such fastidious groomers that it is frequently impossible to find any evidence of fleas or flea dirt on the coat, especially if only one or two fleas are causing the problem. 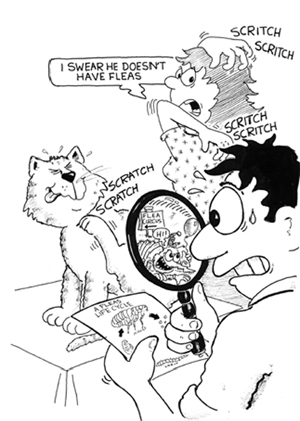 Intradermal allergy tests (skin tests) or specialized blood tests (IgE tests) can confirm flea allergy in your cat. What is the treatment for flea allergy dermatitis? Since the flea saliva causes the reaction, the most important treatment for flea allergy is to prevent fleabites. Strict flea control is the foundation of successful treatment. There are many highly efficacious flea control products, both for treating the cat and for controlling fleas in the environment (for more details, see our handout "Flea Control"). "Allergy shots" are used in an attempt to reprogram the cat's immune system." Some cats can be desensitized to the adverse effects of fleabites. Flea saliva extract (flea antigen) is injected into the cat in tiny amounts over a prolonged period. These "allergy shots" are used in an attempt to reprogram the cat's immune system so it no longer over-reacts to flea bites. If successful, itching no longer occurs or is less intense when the cat is bitten. Desensitization therapy is successful in approximately half of FAD cases. What about steroids or other drugs? "Cats are more resistant to the negative side-effects of steroids than humans and dogs." Corticosteroids ("cortisone" or "steroids") can be used to block the allergic reaction and give immediate relief. This is often a necessary part of treating flea allergy dermatitis. Some cats respond best to long-acting injections and others to oral medication. "Your veterinarian will discuss the pros and cons of the various treatments for FAD with you during the examination, and will recommend the safest and most effective treatment plan for your pet's individual needs." Cats are more resistant to the negative side-effects of steroids than humans and dogs, but significant side-effects can occur if they are not used properly. For this reason, the goal is to administer the smallest amount of steroid needed to keep the cat comfortable. For some patients, combining corticosteroids with antihistamines and/or Omega fatty acid supplements will provide the ideal form of relief. If your cat develops a secondary bacterial skin infection (pyoderma) because of the scratching, antibiotics may also be necessary.